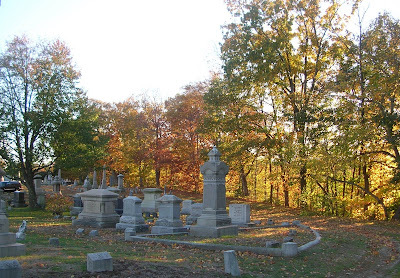 This is Yantic Cemetery and one of my favorite haunts - no pun intended! 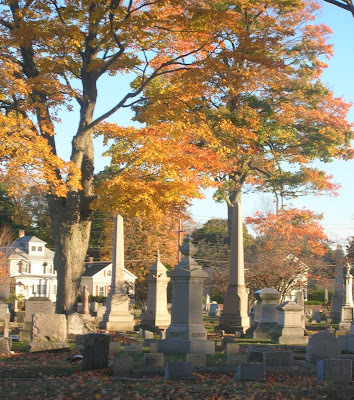 Established in July of 1844, the cemetery covers 28 acres near the William W. Backus Hospital here in Norwich - ever wonder why cemeteries are so close to hospitals?? The final resting place for many of Norwich's prominent citizens, a former Connecticut governor, several Civil War generals, a host of other politicians. and a lot of other 'regular folk', I've enjoyed walking around this particular cemetery many times and have taken a lot of pictures there. Amanda figured that with it being so close to Halloween and it finally being a nice day (we had rain pretty much all week), it would be a good time to get some new pictures for her MySpace page as well as maybe get a few shots of some foliage before it all blew off the trees in the strong winds we've been having. 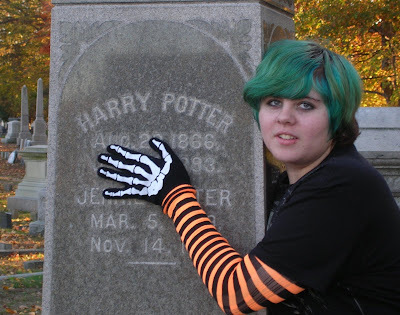 We tried to find some of the more unusual looking graves to get pictures of. This is a table top crypt (the type that Mo probably liked to dance on in his college days!). There were a few trees that had some very colorful foliage while others were completely bare while still others didn't have a single leaf that had turned yet. It was quite cold while we were walking amongst the stones and monuments but it seems like it's always colder in a cemetery for some reason. Here Amanda poses with Sarah, my very favorite monument in the cemetery. Kind of neat how the color of Amanda's hair almost matches the green that Sarah's copper has turned to, isn't it? Oh - and for all those Harry Potter fans out there - look what we found! Obviously there were a lot of Potters that lived in Norwich and were buried in the Yantic Cemetery as we found another monument close by the first one. All in all, it was a nice day to be walking amongst those who lie in peace near the Yantic River. 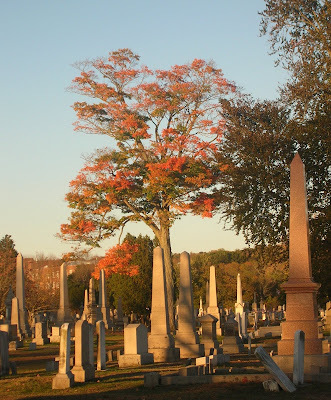 Soon there will only be bare trees watching as silent sentinels over the many headstones that stand as monuments to those who lie beneath them. What a delightful day. 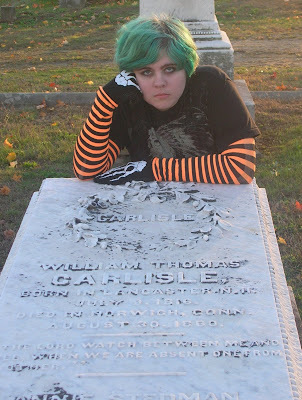 I've always been fond of cemeteries myself. 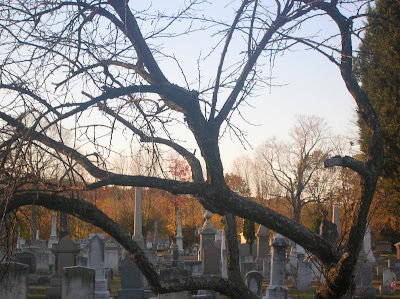 Any time you feel like doing a good dead, genealogists love to know when a particular cemetery has had all its graves noted, so I usually ask when visiting a new one. Awesome photos and descriptions. Sounds like a great day. I, too, take the kids to a local regional cemetery which houses many of the founders of our town. My youngest, sadly, believes any marker denotes a dead person lying there. Hard to explain dedications of ball fields and the like. He just figures the dead people liked baseball. You got some really great shots of Amanda! I love those gloves. They are cool. My favorite shot is the one of her with the angel. 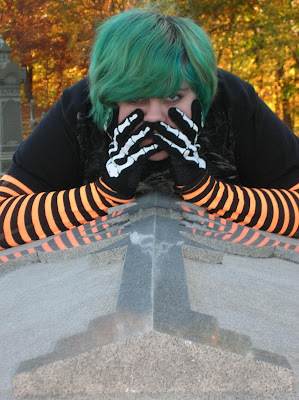 There's nothing like a cemetery for photo ops! Amanda looks amazing next to Sarah. 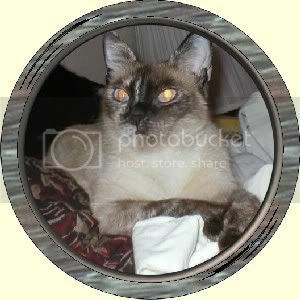 Speaking of death, I represent Felines for Fairness. We are demanding you come clean, and soon. You have 7 days to prove that you can meet our demands. Those are gorgeous photos! I love the lights and shadows, especially. And Amanda...what can I say? I love that she's her own person and has a flair! Looks like you had a pretty awesome day. Glad to hear it, since you & Amanda obviously deserved to have a little enjoyment out of this weekend. "Mrs. Bulldog" & I like to go through cemetaries every once in awhile, but usually they're somewhere famous like Gettysburg, Salem, Harpers Ferry, ect. Perhaps we should try somewhere local for a little "Hometown History". 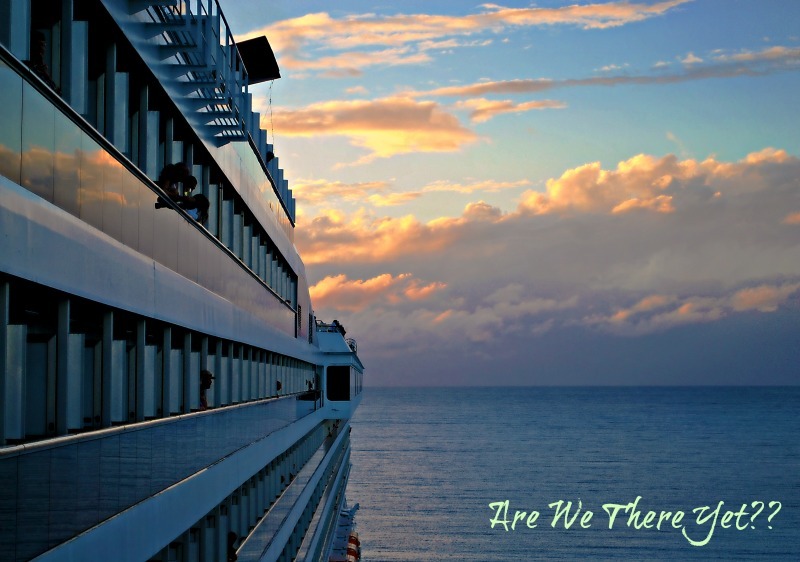 Thanks for sharing your pics w/us! 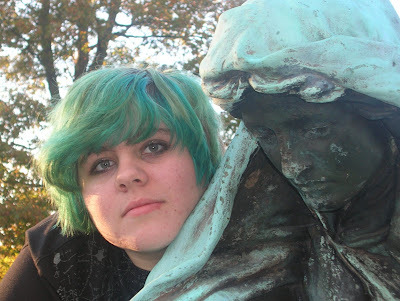 I love old cemeteries. You can get a good historical picture of the area from cemeteries. 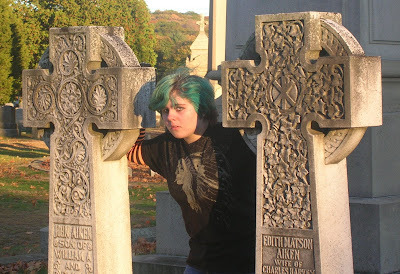 I love Amanda's hair and outfit - very fitting for a mooch round the cemetary! I find old gravestones fascinating too. You might enjoy reading the The Villager today for a famous Potter family in New Hampshire. I absolutely love walking through old cemetaries. Love Amanda's look...fits so perfect with those pics... LOVE IT! That's a fine old cemetary, with so much history. The pictures are well taken; Amanda looks great in that outfit. A Quality Post. down her graveyards are all close to churches...not hospitals....then again, subvet says the relative number of churches and bars is reversed between this part of country and your area. 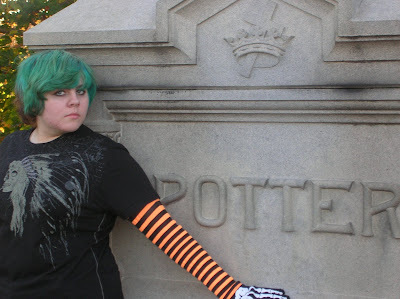 What an interesting look you gave us into the old cemetery. It reminds me of two of the old ones around here. I also enjoy reading the names of the prominent families that used to inhabit the area. Lots to learn! I love Amanda's poses, and the gloves are great. I've never actually gone walking in a cemetary. Check it...I've been in Golden Gate Cemetary outside of South San Francisco. That's where my grandma is. I guess I should have said I've never taken a pleasure walk through a cemetary. 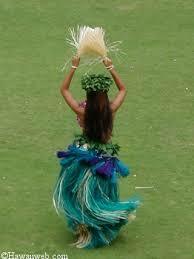 Hmm very interesting and nice pictures. What Were You for Halloween?? And Now a Word ... Not From a Sponsor! Mama Said There'd Be Days Like This! Would You Buy a House From This Woman? October - The Eighth Month? Not Something You See Very Often! Creep on Over to The Mo Show Wednesday Night! Three Words - Fairy Wings, Again! I'm Such a Silly Goose! Kids Will Be ... Uhm ... Kids?? Catching Up ... Or At Least Trying To! Two Words - Great Weekend! The Mo Show Comes to Connecticut! Introducing LynZ - The Plushie Version! Don't Miss the Mo Show This Week!